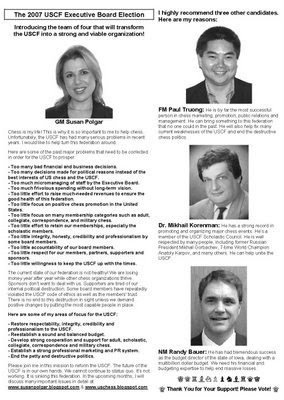 New USCF Election Flyer from the Polgar Team. Used with permission. FM Paul Truong: He is by far the most successful person in chess marketing, promotion, public relations and management. He can bring something to this federation that no one could in the past. He will also help fix many current weaknesses of the USCF and end the destructive chess politics. Dr. Mikhail Korenman: He has a strong record in promoting and organizing major chess events. He’s a member of the USCF Scholastic Council. He is well respected by many people, including former Russian President Mikhail Gorbachev, 7-time World Champion Anatoly Karpov, and many others. He can help unite the USCF. NM Randy Bauer: He has had tremendous success as the budget director of the state of Iowa, dealing with a multibillion dollar budget. We need his financial and budgeting expertise to help end massive losses. The current state of our federation is not healthy! We are losing money year after year while other chess organizations thrive. Sponsors don’t want to deal with us. Supporters are tired of our internal political destruction. Some board members have repeatedly violated the USCF code of ethics as well as the members' trust. There is no end to this destruction in sight unless we demand positive changes by putting the most capable people in place. - Restore respectability, integrity, credibility and professionalism to the USCF.- Reestablish a sound and balanced budget. - Develop strong cooperation and support for adult, scholastic, collegiate, correspondence and military chess. - Establish a strong professional marketing and PR system. - End the petty and destructive politics. Please join me in this mission to reform the USCF. The future of the USCF is in our own hands. We cannot continue to status quo. It’s not working. It is sinking this federation. I cannot do this alone. I need the help of a team of highly qualified and competent board members to work on fixing the USCF. That is why we need Mikhail Korenman, Randy Bauer and Paul Truong. Thank You for Your Support! Please Vote! Please feel free to download, print it out or distribute to anyone you wish. Thank you! Source: susanpolgar.blogspot.com. The author has been a world champion in four different categories including Women's World Champion. She is the highest rated woman player in America and the second highest rated woman player in the world (behind her sister Judit). She is the first woman in history to earn the Grandmaster title. Thank you Susan for letting me use this article!